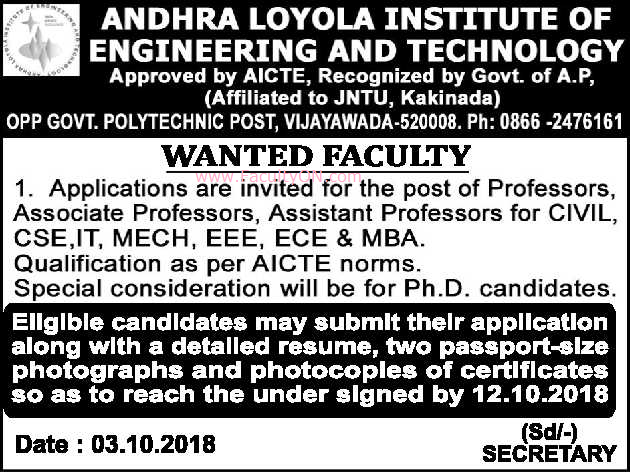 Andhra Loyola Institute of Engineering and Technology, Vijayawada has advertised in the THE HINDU newspaper for recruitment of Professor / Associate Professor / Assistant Professor jobs vacancies. Interested and eligible job aspirants are requested to apply on or before 12th October 2018. Check out further more details below. About College: Andhra Loyola Institute of Engineering and Technology (ALIET) is a sister – institution of the reputable Andhra Loyola College , Vijayawada. These two institutions are administered and run by the Loyola College society, Guntur-Vijyawada. ALIET was approved by AICTE, New Delhi, on 04-06-2008. The institution is recognised by the Govenment of Andhra Pradesh and affiliated to JNTU, Kakinada.